This attachment transforms any rotary tool, such as the Dremel 3000, into a miniature router for even the most intricate work. Precise depth settings for hinge mortises, inlay work or even freehand cutting of relief pieces and similar patterns. The tightly grouped controls and a 100 x 75 mm base simplify work on slender surfaces or close to edges. An opening in the base gives the operator a free view of the cutting tool. 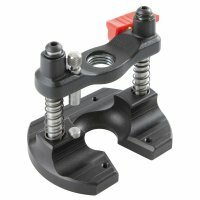 The depth stop has a micro-adjust screw. The cutting depth can be locked if necessary (max. stroke 30 mm). The grooves in the base allow the operator to guide the attachment using his fingertips while leaving the palms to rest on the workpiece. Die cast aluminium with stainless steel depth gauge and controls. Socket for collar with M19 thread (Dremel 3000 No. 704122, Bosch Rotary Tool No. 712242).